People, we are gonna tour! Underneath the dates. We’d love to meet you at one of these venues. New dates will be added soon! Booking requests can be made here. Our new single Rock Café is now out on Spotify, Deezer, Apple Music, and even on YouTube. Go check out the video and see how Erik portrays a loner who yearns to be a rock star. He finds his comfort and escape in an alternate universe: his bedroom closet. And here’s the fun thing; you decide how the video ends. Go watch! We will rotate around, and near, you. 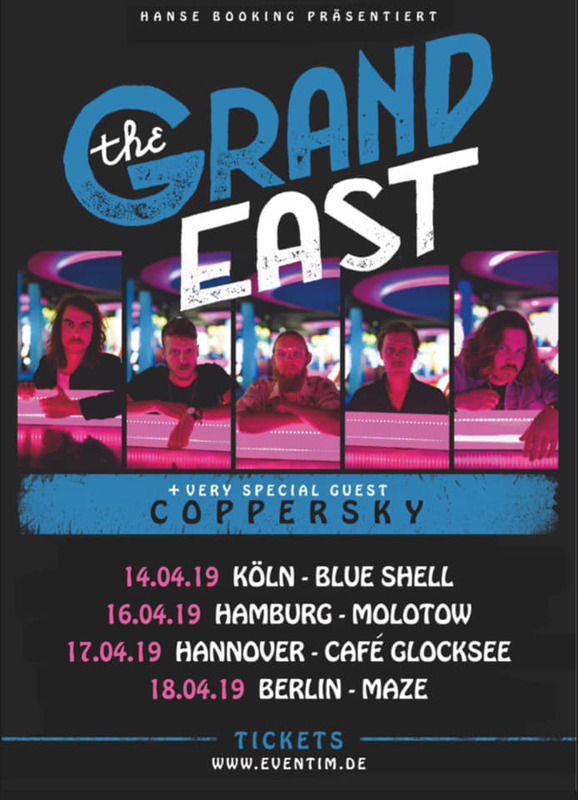 We are heading out on tour in April with the amazing The Grand East! Presented by Eclipsed Magazine and booked by Hanse Bookings! Check out our show page to see how you can get your tickets! Bloody hell! Our second single ‘Bloody Honeymoon’ is out on all digital platforms. Go check it on Spotify. Fun fact: during a live-performance of Bloody Honeymoon, a guy in the crowd started to ride an imaginary horse. Gittyup! We guess the song is bloody grooving and appeals to cowboy hip movements. Our new song ‘Dressed in Wool’, off our new unreleased album ‘Orbiter’, is out on Spotify, Deezer, and Apple Music! Orbiter, our third full-length album, will be released on February the 22nd, 2019, with Hamburg-based popup-records [Germany]. The release will be celebrated with shows in the Netherlands, Germany, and beyond. But first, check out the video here! Oh boy, we are excited, we hope you are too! We’re proud to present “The Brotherhood Tour”, our winter tour through Germany made possible by our friends & allies Muttis Booking! Hope to see you at one of these shows! Noisiv.de, Museek.de, Count Your Bruises Magazine, Balbex Drumsticks, Ashdown Engineering, Stay close to your soul.